This monitor and keyboard mount is easily installed onto a wall, and is a space saving and economical solution for small spaces. Most wall mounted workstations or rolling standing desks cost 5 to 10 times the price of this wall mount platform. The vertical tray connects to a wall mount on the back side and to a monitor on the front side. The large keyboard platform sits directly beneath the monitor. The large tray provides 25 inches of space to allow for a keyboard and a mouse. The soft mouse pad that comes with the keyboard tray helps to improve your comfort. 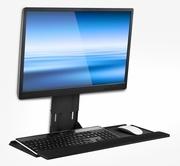 The height of the keyboard tray can be adjusted easily to suit different users. Other ergonomic benefits include soft wrist pad and adjustable tilt angle keyboard tray. The keyboard platform has a lip to keep the keyboard in place, even when it is tilted down so you don’t have to worry about your equipment sliding off. You can select a slim monitor wall mount for a low-profile installation or a swivel wall mount to be able to swivel the entire assembly left or right. The monitor mount is sold separately. The tray works with any wall mount that has a VESA 75x75 or 100x100 standard bolt hole pattern.